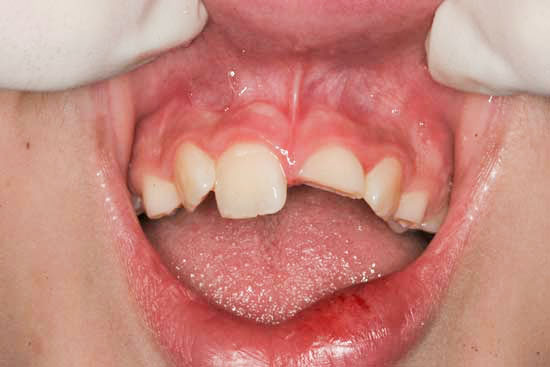 Tooth trauma is very common in children due to their active nature. The upper front teeth are the main victims. The damage can be anything from a small chip to outright “extraction”. 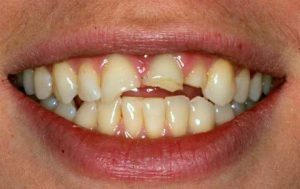 A chip usually involves just the corner, small or large, half the tooth horizontally, or the whole tooth at the level of the gums. It creates panic due to its unsightly appearance. 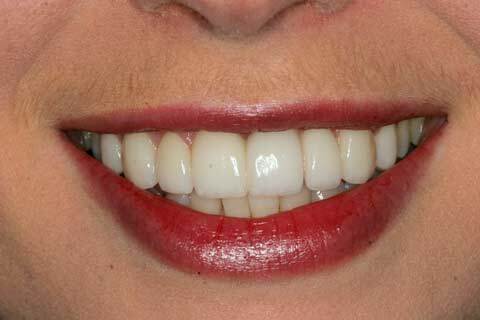 However, these teeth can be treated by a dentist experienced in bonding and aesthetic procedures. A small chip: There is no urgency to see a dentist. However, a regular dental appointment should be made for a cosmetic bonding procedure of the chipped tooth. A large chip involving dentine exposure: the tooth will be extremely sensitive to air, cold and hot drinks. Definitely visit the dentist within two days. 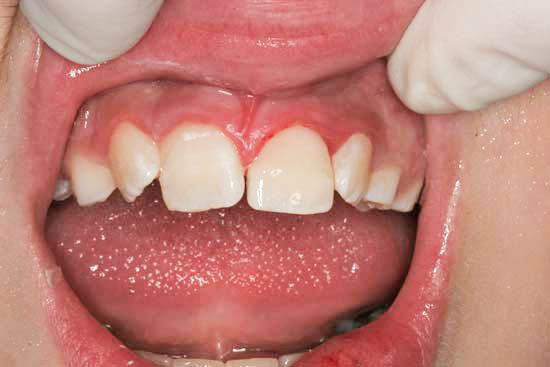 A large chip involving exposure of the nerve: If you see a small pink or bleeding point in the middle of the fracture area, you should visit the dentist as soon as possible. In the meantime, avoid noxious foods, cold and hot drinks, sweets, and even touching the area. 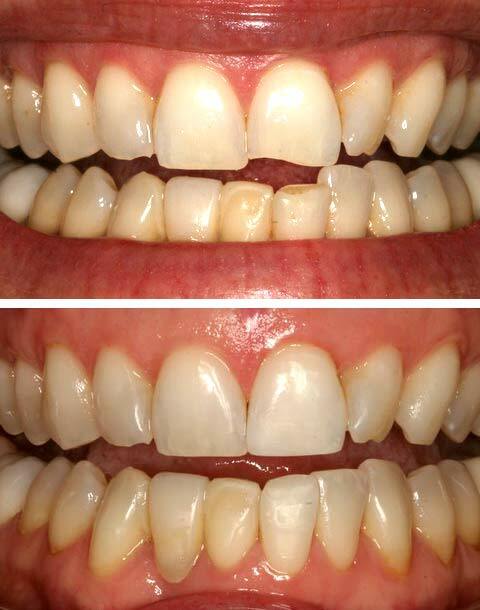 Restoration of a tooth fracture can be combined with the application of veneers, and the results can be amazing. This patient could not stop smiling after all was done. Homeopathic remedies to consider: Traumeel and Hypericum 30c alternating once an hour on the day of injury. If your child falls and knocks out a tooth, do not panic. Find the tooth, pick it up carefully from the crown (not the root), rinse without rubbing the root, and preserve it in a saline solution such as Save-a-tooth®, contact lens solution or any eye-drop solution. Saliva can be used, milk is not recommended any more. Wrap it up carefully so it does not dry up. Take the child to a dentist as soon as possible. The tooth may actually be re-implanted and splinted for a few weeks. Giving homeopathic Traumeel or Arnica every half hour will help. Children under 5: the tooth most commonly knocked out is an upper primary incisor. It is of no grave consequence if the tooth is lost, however esthetics and phonetics (development of speech and pronunciation) may be an issue. Children between 6-8: The primary incisor is close to being shed and already loose due to the fact that the roots are much shorter. Do not bother re-implanting, as very soon the permanent incisor will appear. High and ongoing cost of providing interim and final restorations for these teeth. It is evident that parents have to treat an incident like this more seriously than a bone fracture. A bone will heal and that’s the end of it. Unless it is kept alive and re-implanted, a tooth lost cannot be replaced, and will run expensive bills for years to come. If done early enough, the tooth will reattach, may however require root canal therapy in the future. It should be carefully monitored at every dental check-up appointment. A dead nerve of the tooth. In either case, the swelling and pain arises from the fact that the pus accumulating in the bone and tissue has no way to escape and causes an increase in pressure and pain. The body tries to defend itself by causing the blood vessels to swell and thereby directing white blood cells into the area to fight the infection. This battle releases breakdown products and more toxins which contribute to the pain and swelling. If you experience such an infection visit your dentist immediately. If unable to get to a dentist, you should drink lots of fluids, vitamin C, and remedies that have a natural antibiotic effect, such as Echinacea, goldenseal, oregano extract, olive leaf extract, or homeopathic remedies which help in drainage and infection. Some single remedies useful in addressing abscesses are merc.sol 12c, hepar sulph. 12c, hekla lava 30c, graphites 30c, gunpowder 30c, among others.